This past Saturday was cold and dreary, with the temperature hovering in the mid-thirties all day. Our Internet connection had gone wonky, but no worries as we had plenty to read and a movie to watch. BTW, I really recommend the movie, Headhunters. It’s based on the novel by Norwegian author Jo Nesbo. If you like your Nordic Noir with dark humor and questionable morals, this is for you. I threw together a mushroom soup that turned out pretty fab. It warmed body and soul on a cold autumn night. Here’s the recipe. I used the typical white button mushrooms, but next time I’ll use a mixture. I’m dying to try this with chanterelle mushrooms. This is a single pot recipe. I used our Le Creuset French oven, which I adore, though any large stock pot will do. Take aside about 1/3 of the mushrooms and, using a food processor or blender, chop into a thick paste. Slice the remaining mushroom to your desired thickness. Looking for more soup recipes? Passionate about social justice? Then do I have a freebie for you! 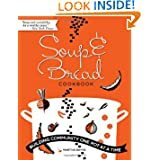 The Soup and Bread Cookbook aims to explore the social role of soup through a collection of terrific, affordable recipes from food activists, chefs, and others. This quirky exploration of the cultural history of soup as a tool for both building community and fostering social justice is the result of a brainstorm: eating your way through a pot of soup day after day can get boring — why not get together and swap some with friends? Now neighbors across the country are getting together regularly for home-based “soup swaps.” In Chicago, the arts collective InCUBATE uses soup as a microfunding tool. And of course, soup can be a political statement: the radical volunteers of Food Not Bombs have been providing free vegetarian soup to the hungry as a protest against war and social injustice since 1980. These are just a few examples of the stories Bayne wraps around a collection of delicious, accessible, and tested soup recipes. This entry was posted in Free eBooks, Kindle Bargains and Freebies, Recipes and tagged Autumn, Books, Free, Kindle, Movies, Mushrooms, Nordic Noir, Recipes, Social Justice, Soup by Lori Saltis. Bookmark the permalink.